BERRY T. WEBB. We are pleased to present to the consideration of our readers, the portrait and biographical sketch of the efficient School Director and Road Commissioner of Richland Township, Shelby County. An old settler in the county and a substantial farmer, he has gained the well merited approval of his neighbors as a worthy Christian gentleman and a citizen whose good judgment and practical good sense made him useful in the community. He resides on section 13, Richland Township, and has been in Shelby County since 1840. John and Elizabeth (Young) Webb, the honored and beloved parents of our subject, were born in Tennessee, the former near Nashville in 1792, at a time previous to the organization of Nashville as a town. He was born in a block house in which the family were shielding themselves from the Indians. He and his worthy wife were united in marriage in Tennessee, and came to Illinois in 1840, settling upon what is now known as section 13, Richland Township, in the days before such organization was effected. Here they passed their remaining years, being thoroughly interested in reducing the wilderness to a farm of thrift, comfort and productiveness. The father died in the seventy-eighth year of his age, and the mother when she was about sixty years old. The parents of our subject reared nine children, of whom one daughter died at the age of twelve years, and eight reached man's and woman's estate. Louisa married Madison Crockett and died in Shelby County; George died in Mississippi; Mary married Thomas Blythe, and after his death became the wife of Jesse Barker, and now resides in Shelby County; Nancy is the wife of Alfred Blythe; Lucretia became Mrs. H. Morgan and died in Missouri. Our subject is the next in age. William died in Dickinson County, Iowa; and Susan Ann became the wife of William Brady, and died in this county. The birthplace of Berry T. Webb was in Tennessee, his natal day being April 8, 1825. It was in February, 1840, that he came to Illinois, where he had two sisters already living, and the remainder of the family emigrated to this State during the fall of the same year. The Mexican War called our subject from the pursuits of peace to the activities of the march and battlefield, and in June, 1846, he entered the United States service as a soldier serving through the Mexican War, and returning home in March, 1847. As part of his reward for service he received a land warrant and with this he entered one hundred and sixty acres of land where he now resides. In October, 1848, the returned soldier began his domestic life by his marriage to Maria Ann Curry, who was born in Tennessee, March 15, 1826. Since marriage, the family home has been upon the same farm, to which Mr. Webb has added by purchase from time to time, until he now owns four hundred and twenty acres of as fine land as is to be found within the limits of Shelby County. To Mr. and Mrs. Webb three children have been granted, all of whom are residents of this county, namely: John W., Louisa E., and Martha E., who is now the wife of Lafayette Stirwalt. 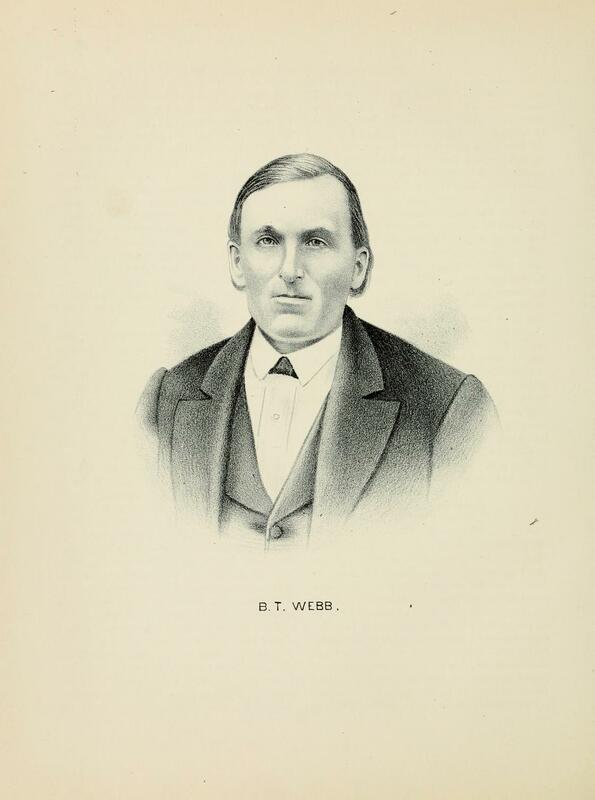 Democratic simplicity, in the belief and practice of which Mr. Webb was brought up, and which he earnestly believes to be the true doctrine upon which to base the life of the country, still commands his adherence and his vote. He has been a member of the Separate Baptist Church since the spring of 1848, at which time an organization was effected near his home, and his life both in his church connection and in business circles has from that day to this adorned the doctrine in which he believes. The influence of his family in the community is one which is conducive of good to all who come within the circle of its radiance. Extracted 13 Jan 2018 by Norma Hass from 1891 Portrait and Biographical Record of Shelby and Moultrie Counties Illinois, pages 458-460.